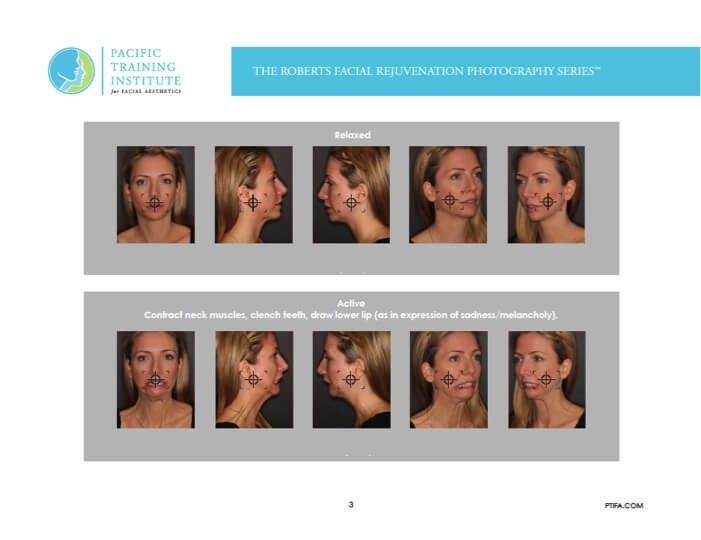 What is the Roberts Facial Rejuvenation Photography series? The Roberts Facial Rejuvenation Photography™ (RFRP) series is a standardized set of clinical photos developed by Botox trainers, Drs. Warren and Jan Roberts. Drs. Roberts spent over three years analyzing each angle and section of the patient’s face and neck that needed to be captured for aesthetic & therapeutic analysis & treatment. The RFRP series includes 29+ photos which capture each section and angle of the patient’s face; including photos of the patient in both relaxed and with muscles dynamic/active. Why is photography for Botox and cosmetic injectables important? Documentation of the patient’s pre-existing condition, the exact sites injected and the results of any treatment provided are critical for improved patient care and evaluation (as well as medical-legal reasons). Photography and the Botox treatment record form are invaluable tools. The Roberts Facial Rejuvenation Photography series is taken at each appointment to record the pre-existing conditions and the changes that have occurred following each treatment. Additionally, learning how to present photography in the ‘Ideal Botox Treatment Process’ plays an important role when communicating with patients. The ‘Ideal Treatment Process’ allows patient’s to unveil their personal sensitive concerns, wants and needs. Rather than having to tell a patient what treatment you recommend, this process allows the patient to express their desires to you. At PTIFA, our Level 2 course teaches you this process of presenting photography to the patient. The result is the patient asks you to proceed with treatment. How often is the photography series taken? The Roberts Facial Rejuvenation Photography™ series is taken every time the patient is seen: consultation, time of treatment and at the post-op appointment. Each of the 29 photos is taken every time. If treatment is provided, photographs should also be taken of the patient’s markings in relaxed and dynamic state (see example below). The precise markings create value to the patient. Where are the photographs actually taken? The Roberts Facial Rejuvenation Photography™ series should be taken in a designated photography area of your practice. It is important to have an area with controlled lighting, a proper adjustable chair, a black back-drop and a proper digital camera. If your team is new to the RFRP series, you’ll want to have a copy of the photography syllabus at hand as well. The marked photos of your injection sites are typically taken with the patient in the chair. Log-in to the Study Club for tips. Who takes the photos and how are they managed and stored? Chair-side assistants or a team member within the office typically take the Roberts Facial Rejuvenation Photography™ series. Once trained & mastered, your team should be able to take the entire series in under three minutes. The photos are stored in FACETEC – a software program designed to manage your photographs, compare results and create portfolios of your best cases. Patients love to see their improvement and anticipate seeing the results instantly compared on FACETEC. 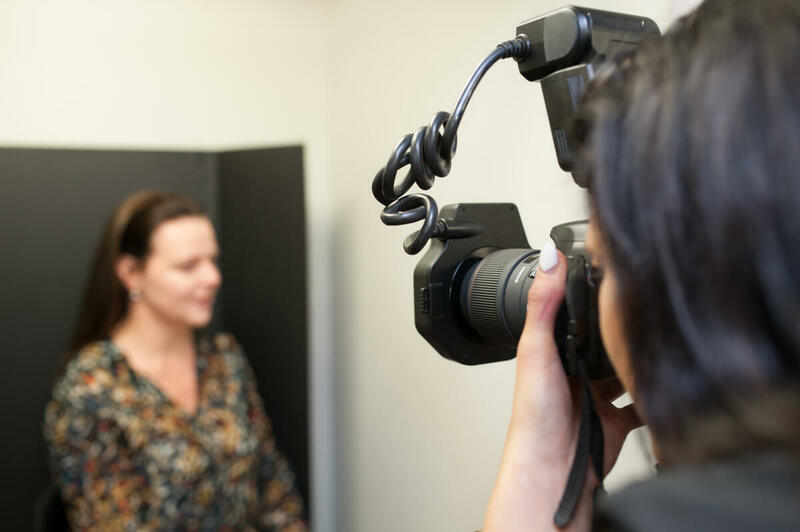 To learn more about photography for Botox and facial rejuvenation, we recommend that you take the Level 1 online course which reviews photography and record keeping, as well as hands-on photography training in the Level 2 Basic Botox training course.